December 12, 2001 No snowmonkeys have been sighted near the Huckins site, as this is a globally warmed December if there ever was one. 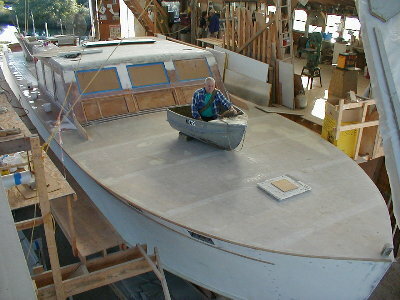 Brain-Stormin’ Norman obtained one third of a sawed-up jonboat, and fashioned it into a fine little dinghy after work one day. Not only did it float, but was featured as part of the Blake Boatworks Zydeco float in the Down East Christmas parade, cradling our hula-hooping triangle player Xoe Wise. 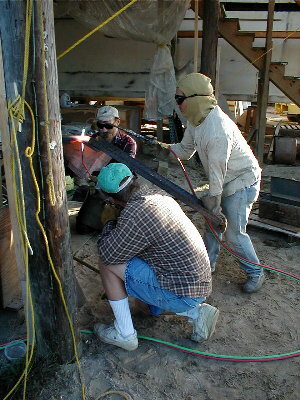 Bryan, Leonard, and Bill fired up the rosebud torches and are in the process of fabricating the engine mounts. Once shaped, the mounts will be painted and bolted to the engines. Then the engines will be placed in the boat. Cherokee’s interior is coming right along. The aft cabin now has both bunk structures permanently in place. Here are shown two drawer cut-outs. The space to the side and aft of the drawers under the bunk is also used for storage. 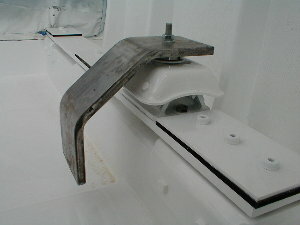 An electric ram will be used to raise the mattress and allow access to this area. 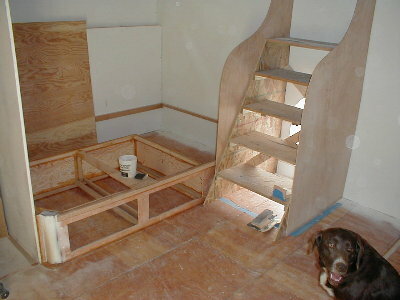 The stairs, mocked-up and showcased below by Casey, lead to the companionway. This will give access to the cockpit from the owner’s stateroom. Jeanette is continuing to sketch out interior designs for the master stateroom and the guest staterooms and heads. 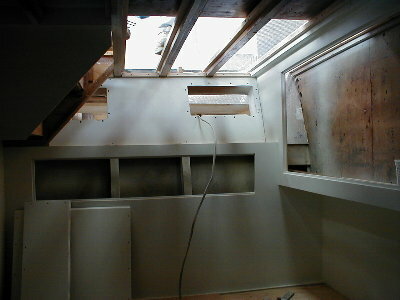 The decking behind the main staircase and over the guest stateroom had been partially removed earlier to aid in placement of large panels into the interiors of these rooms. 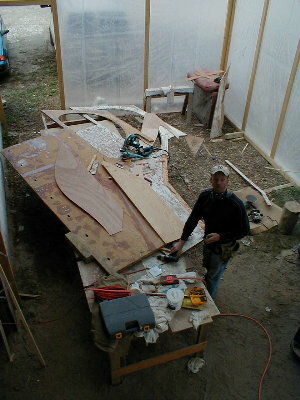 Leonard and Jim are now gluing these decks in permanently. Fish Doc thinks the light is nice below, and suggests the decking be replaced with skylights – sort of the inverse of a glass-bottom boat. New equipment has been getting delivered like Christmas gifts. That is not Doctor Who below with his latest time-traveling contraption. It’s Bryan checking out the new S.K. 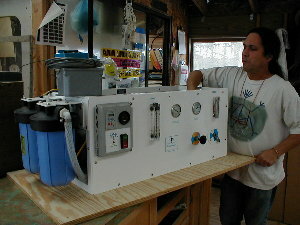 water maker, which is a reverse osmosis system converting salt into fresh. 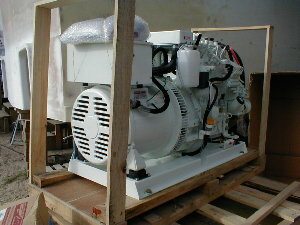 Also arriving was the Huckin’s new Northern Lights generator, the power source. In other Cherokee news, Tom Parker and Bud have been working on the pilot house sides which were removed for sanding and painting. 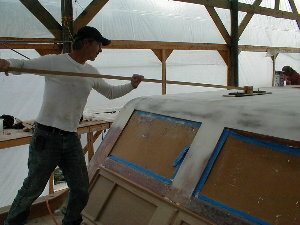 Leonard and Bill Brown have been preparing the rest of the cabin for fiberglassing and painting. Everyone else is sanding, sanding, sanding. 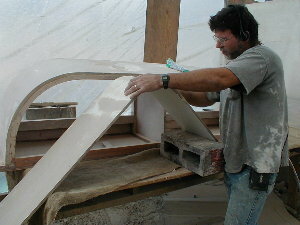 Bill Davis is employing a board sanding mechanism to work on the cabin roof.